One of the most important parts of having the best possible sound system experience in your truck is making sure that your amp is performing the best that it possibly can – and simply put, the best way to do that is to make sure that the amplifier is closer to the battery than it is to the speaker it is powering. 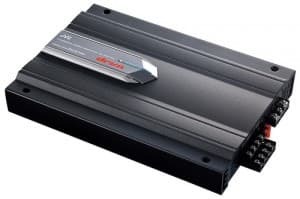 In most automotive sound system installations, you’ll find the amplifier very close to the speaker, and we don’t want that – so we’ll move it to, or if it is a fresh installation, install it underneath the driver’s seat of the truck. The first thing that we want to do is ensure that the amp will fit underneath the seat where we want to place it. simply measure the amp’s dimensions (length and width), then check the space under the seat. Figure out the best place to put the amp while keeping in mind the fact that people will still be able to sit in the back seat behind the amp. After removing the wire from the battery leading to the amp in order to prevent any shorting, we move the amp temporarily into place underneath the seat, checking to be sure that when we move the seat backwards and forwards to adjust it, it doesn’t scrape the amp. In addition, you need to be absolutely sure that screwing the amp into place will not result in the damaging of any important components of the truck, such as brake lines. The next step is to mark out the holes of the amp, so that you can drill out the holes without the amp in place. After those first marks from the back of the amp are in place, you’ll need to remove the seat to make the front marks, then drill out all of the holes and screw the amp into place under the seat. After placing the seat back on top of the amp, simply hook the amp back up exactly as it was connected in its previous position or as the instructions tell you to (you may have to buy some more wire, just ensure that it matches the existing wire), and you should be ready to enjoy your new amp or its new position.